There are (almost) as many email components as there are grains of sand on a beach, and many of them even are free. 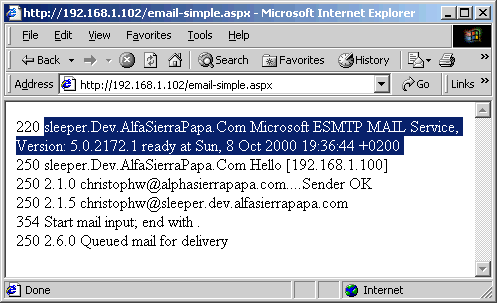 Certainly (almost) everyone has used them, be it AspMail, CDONTS, SA-SmtpMail or one of many others. 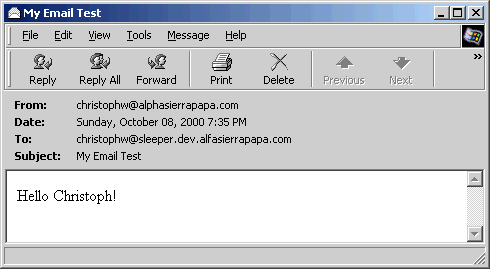 Something that (almost) no one has done up to now is programming his or her own email component. In today’s article we will concern ourselves with the basics and send a very simple email message. In future articles we will build on the source code presented today and will finally have a fully functional component for HTML emails and attachments. Prerequisite for using the source code in this article is an installation of the Microsoft .NET Framework SDK on a Web server. Besides that, presuppose that the reader is familiar with the C# programming language to some degree. First we have to figure out how the SMTP (Simple Mail Transport Protocol) Protocol works as it is the foundation for the sending of emails. The beauty of it is that all the commands and replies to them from the SMTP server are clear text (which on the other hand might be considered to be a security issue…). The parameters HELO, MAIL FROM and RCPT TO are unspectacular and were ‘previsible’. The DATA parameter, however, is interesting: the header (Subject) and body text are separated by a blank line. This example sports only one header (Subject), further examples will insert the missing headers. The dot (which has to be on a separate line) finally terminates the email and the server reports the status of the operation. Apropos status reports: each of the commands shown returns a status message from the server – these can come in very handy! We will now transport this process 1:1 into C# using the System.Net classes of the .NET Framework as helpers. Basically, it all now is a mattter of an instance of the TcpClient class and its Stream for connecting to the SMTP Server and for exchanging commands and status messages. The file email-simple.aspx is part of the download for today’s article. Concentrating on the lower part of the listing (the blocks of code three-liners), we see that this really looks no different from creating an Email using Telnet. The funcionality for sending the commands and for querying the status messages is hidden in the methods WriteToStream and ReadFromStream, respectively. 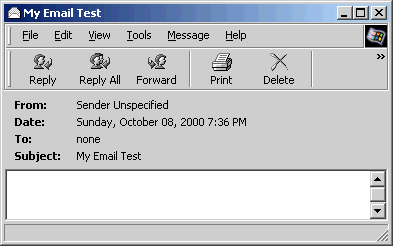 However, the result looks less than appealing, as Outlook expects special headers for sender and recipient – Eudora isn’t as nitpicking as far as this goes, but less popular. Thus we must program a little additional something into it to make the Outlookians think favourable of us.